Automatic electric fan controller attaches to the inlet port of the oil cooler. Activates the electric fan when the fluid temperature reaches 180°F and shuts the fan off when fluid temperature reaches 165°F. For use AN or push-on hose style tube ends. 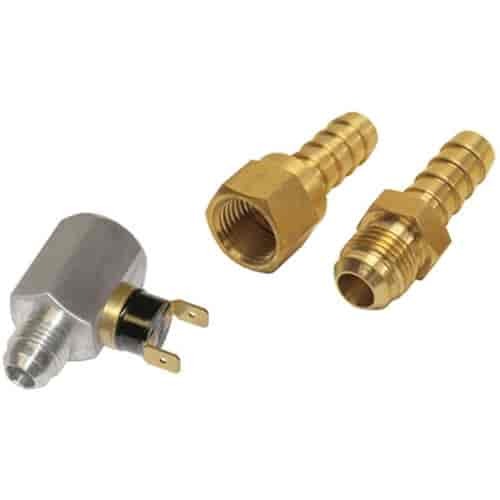 Derale features a full line of accessories that include Radiator Adapter Fittings, Hoses, Mounting Kits, and other accessories that you may need. These simple but vital cooling parts can mount to almost any brand of transmission cooler or engine oil cooler on the market. Derale offers what you need to get your vehicle back on the road faster. 13021 is rated 4.0 out of 5 by 2. Rated 4 out of 5 by Noshow98 from Ok I would love to say something good about this but as I have not received the transmission I ordered the same day as this I have no way of knowing if it works or not. So if you like not having your emails answered for days at a time and endless phone calls that get you no where order away and have fun. I'm done! Rated 4 out of 5 by deucecoop from Easy Fan Control This unit made it easy to control fan. Instead of the fan being on when ever the key is on, or a much more expensive after market thermo switch. Only draw back was the small 6AN fitting, needs larger to mate up with hoses for cooler.